Growing up I played multiple sports at a competitive level. Sports were just one of those things for me where I could step onto the field or court and immediately feel as if nothing else in life mattered. I felt ageless and limitless. As I became older and sports went away I really missed having that feeling. I started my CrossFit journey in Iowa in 2013. I had several neighbors and friends who were into CrossFit which I knew very little about. The one thing I noticed in common about all of my “CrossFit friends” was they were all incredibly fit and they “loved” to talk about their workouts. This was foreign to me as workouts seemed to get harder the older I became and I certainly did not enjoy telling anyone about my attempted workouts. After doing a little research online I found a nearby CrossFit location and decided to give it a go. I was a little worried that I was not in good enough shape to participate but I spoke to the owner on the phone and he assured me that they could modify any workout to meet me where I was. At the time I was also concerned about my knees. I had so much pain in my knees that I could only go up a flight of stairs backward. Again, I was assured that they could accommodate me. I made the decision to give it a go as they had a free trial, I thought if I hate it I am out nothing. I was so incredibly nervous as I pulled up to the gym for my first workout that I almost left…..I AM SO GLAD I DID NOT. After my trial I was HOOKED and I signed up for a membership. After a couple of months I noticed significant improvements in how I felt and most importantly my knee pain was completely gone. Each and every workout I experienced the same high I had playing competitive sports….during each workout nothing else in life mattered. In late 2013 my wife and I made the decision to move back to Idaho and start a small business. Over the next year 18 months we sold our home in Iowa, moved our family to Idaho where we built a new home, we opened our new office, and most importantly added another child to our family. During this whirlwind of amazing craziness I did not make any time for my fitness and it started to take a toll. As stress levels increased so did my weight. In June of 2015 we held an event to mark the one year anniversary of opening our new business. As I was looking through pictures of the event I saw one of myself and I was shocked at my size. I spoke to my wife about it and she immediately said that she thought I should find a CrossFit location in Idaho. She said “just do it” and she reminded me how much I had loved doing it in Iowa. After the discussion with my wife I started contacting CrossFit locations throughout the valley. The only response I received was from CrossFit Fireside. From that first email to the first time walking through the door I knew I had found the place I was supposed to be at. Ben, Catie and the entire community were so welcoming and supportive. I was immediately blown away by the attention the coaches placed on every athlete in the class. After my trial week I signed up and started to see awesome results. From July 2015 to July 2016 I was able to lose 30lbs. Over the next year I continued to grow and gain confidence inside and outside of the gym. 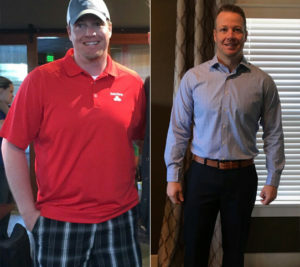 In May of 2017 I was very happy that I had been able to maintain my 30lb weight loss over the previous year but I really wanted to lose additional body fat and take it to the next level. One of the awesome things about Crossfit Fireside is that in addition to having the best strength and conditioning programs in the state they also offer 1 on 1 nutrition coaching. After Catie outlined what the program entailed I made the decision to work with her 1 on 1 for 12 weeks. This was one of the best decisions I have made and it was absolutely the BEST investment I have ever made in myself. Over the 12 weeks I received a program tailored to my NEEDS. Through Catie’s program I discovered immediately that I had been under eating and not fueling my body properly. I was extremely disciplined and followed the program 100% and I can’t think of a single time over 12 weeks that I felt hungry. I was able to lose weight, body fat, and inches at every check point. By the end of the session I had lost an additional 30lbs, 12% body fat and actually gained muscle mass overall. Catie’s program and education also gave me the needed tools and confidence to maintain my results going forward. It feels AWESOME to be at a weight I haven’t been at since I was 22 years old. I am so blessed to have the opportunity to workout with and learn from such amazing coaches in an unbelievable facility with absolutely awesome people. Crossfit Fireside has truly changed my life.